Cat Tropicana – a home from home cattery, designed to provide all the creature comforts your cat requires. We provide comfortable secure accommodation for your cat in a quite setting amongst our apple trees. We are a small and friendly cattery located in a quiet residential area of North Chingford with space for up to 10 cats ensuring your cat gets all the attention he or she deserves to make their stay happy and stress free. Each pen is spacious and cosy with access to sleeping areas open and hideaway for the more quiet residents. We can cater for individual needs for your cat as required. We have single, doubles and a family pen (when required) for the larger families! Our guests, are also given interactive toys to play with, and treats, if allowed! 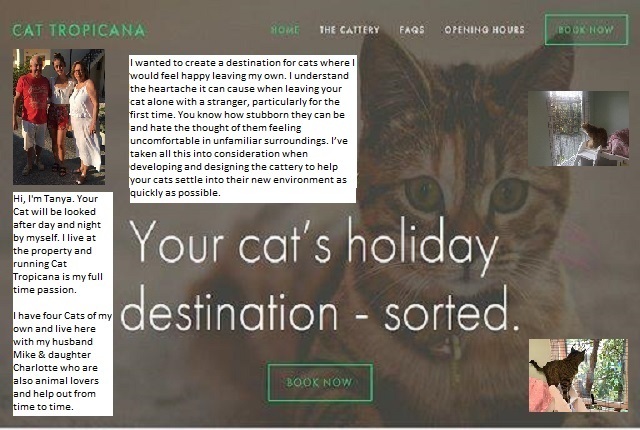 For more information about Cat Tropicana, you can visit them in person, visit their website, telephone or send them an email (if available) using the form below. Sundays and Bank Holidays 10:00-12:30. Christmas Day, Boxing Day & New Years Day closed. Viewings welcome by appointment.